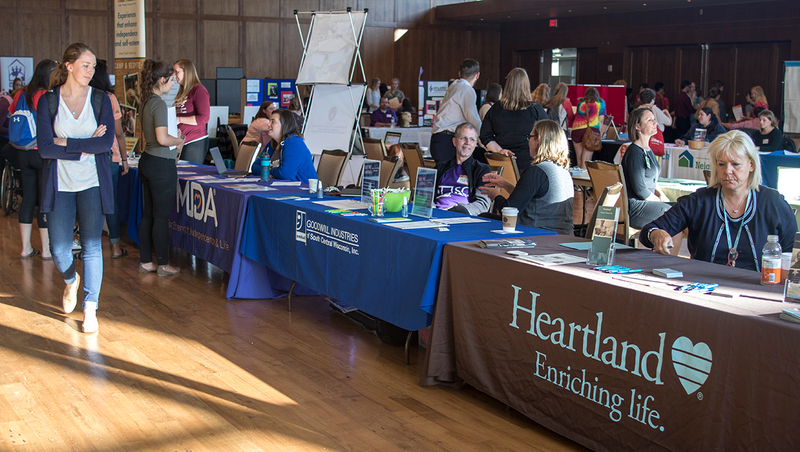 Our two annual Public Service Fairs draw hundreds of students eager to learn about volunteer, job and internships opportunities with your organization. The University of Wisconsin-Madison recently transitioned to a new career services software platform, Handshake! After you register for a Handshake account, click on the registration link. Participation is limited and based on a first-come, first-served basis. Registration is conducted online. Invitations are sent to all organizations registered on VolunteerYourTime.org several weeks prior to the fair’s date. Organizations may add electricity for an additional fee. Table assignments are made to organizations based on the order in which registrations are received. There is a fee for all non-student organizations wishing to participate in the Public Service Fair. Payment can be made by credit card. Organizations can check in on the second floor of Union South starting at 12:30pm before the start of the Fair. A networking event for employers to meet each other and campus staff will be held from 1:45 – 2:45pm. If an organization does not arrive within a half hour of the start of the fair, their spot can be given to another organization on the waiting list. Cancellations will be honored up to two weeks prior to the fair. Parking is limited around Union South and not provided as part of your registration. We recommend Lot 80 under Union South or Lot 17 at Engineering Hall. We highly recommend making parking arrangements before coming to campus. You may purchase a daily or half-day permit ahead of time. Complete the value permit order form (https://transportation.wisc.edu/visitor-parking/) or call Special Events at (608) 262-8683. Please allow two weeks for processing. Inquiries about visitor parking can be sent to visitorparking@fpm.wisc.edu or to our main office location (610 Walnut Street), Attn: Special Events.